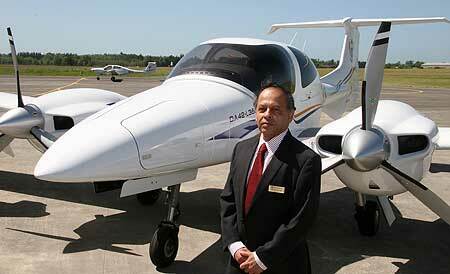 School of Aviation chief executive officer Ashok Poduval with one of the DA42 aircraft. 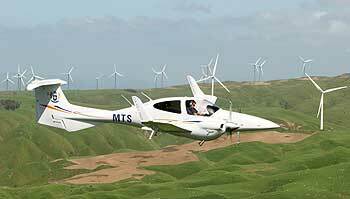 The DA42 over the Manawatu wind turbines. Aviation students at the University will be among the first in line for commercial airline pilot jobs with Air New Zealand thanks to a new partnership launched today. The University’s School of Aviation has been selected to partner with the national airline’s new training institute. The appointment follows a rigorous assessment of flight training organisations by Air New Zealand to validate the University’s current programme and reflects its high quality and standards. Students who successfully complete the Bachelor of Aviation programme will be among Air New Zealand’s preferred candidates for first officer positions when the airline is recruiting. The school is one of the few institutions in the world that offers degrees in aviation with integrated professional pilot training. It also offers aviation management programmes at undergraduate, postgraduate and doctoral levels. It is part of the College of Business, is a certified flight-training organisation, has ISO 9001-2008 accreditation and holds an equivalence approval from the New Zealand Civil Aviation Authority. It purchased a fleet of 14 new aircraft two years ago, at a cost of $8 million, putting it at the forefront of international aviation training. Air New Zealand’s Aviation Institute is a new initiative by Air New Zealand to increase training opportunities for pilots, engineers, flights attendants and frontline check-in staff. The University is one of five training partners involved.